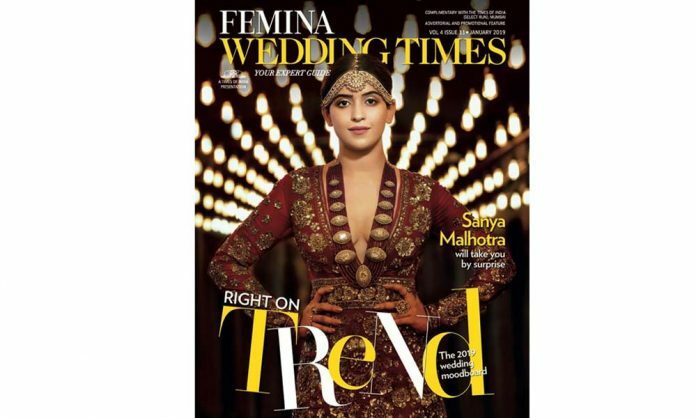 Sanya Malhotra Nailed The Bridal Look On The New Magazine Cover! Home BOLLYWOOD Sanya Malhotra Nailed The Bridal Look On The New Magazine Cover! The Pataakha of Bollywood, Sanya Malhotra looks ethereal on her new magazine cover. The actress has pulled off Strong yet Beautiful bridal look effortlessly where Sanya has worn the Maroon embellished deep-neck dress. Adding more glamour to bridal look, Sanya Malhotra accessorised her look with studded maang-tika and multiple jadau rings in her hand. The actress’ journey in B-town from a wrestler to a high-class girl in Badhai Ho has been a captivating one. Be it on-screen or off, Sanya doesn’t fail to surprise us with her curated looks and makeup. By donning stunning attires for various occasions, young star Sanya Malhotra never misses to grab our eyeballs. Sanya played 2 diversly different character in her last 2 films, Patakha, which was directed by Vishal Bharadwaj and Badhaai Ho directed by Amit Ravindernath Sharma. In Patakha the actress played the role of a girl from a very small Village of Rajasthan, which is based on an acclaimed short story by renowned writer Charan Singh Pathik. And in Badhaai Ho she plays Delhi girl who knows what she wants in her life. On the work front, her next film starring Nawazuddin Siddique, directed by Ritesh Batra ‘Photograph’ will be screened at Sundance Film Festival. Next articleMahesh Babu Wraps The Schedule Of Maharshi Before New Year!